Looking for info on hearing protection? Consider the background, or ambient, noise common to heavy industries (construction, mining, oil, etc. ): that noise is loud, constant and everywhere. This can be a serious challenge when maintaining loud and clear communication is key to worker productivity and safety; especially in an emergency. Radios, headsets and speaker mics with noise cancelling features filter out the background noise common to industrial environments. Noise cancelling headsets go a step further – adding a level of hearing protection for your team. Technology is available today that can offer protection without completely isolating members of your team from their auditory environment. The benefits of this are easy to spot. Communication can flow easily because workers won’t be shouting over the sound of machinery or straining to hear what’s being said. Your crews will be able to do the job more safely while maintaining awareness of their surroundings. There are two types of noise cancellation: active and passive. Passive noise cancellation is basically soundproofing, and it depends on the physical design of the device (typically a headset). The foam or rubber padding of “over-the-ear” headsets would be a form of passive noise cancellation and the ‘in-ear’ design of earbuds would be another. 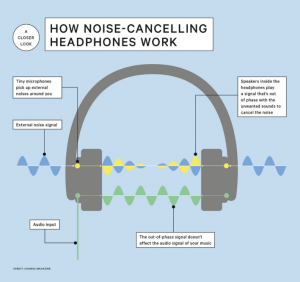 Active noise cancellation is more complicated. Headphones, headsets, speaker mics and two-way radios with this feature use microphones to detect and gauge background noise. Then, the device emits a frequency opposite to that of the background noise and mixes it in with the audio a user is trying to listen to, like a call from their site supervisor. The end result is that background noise is canceled out or, at least greatly diminished, and the user can clearly hear what he or she needs to. When the user is speaking, active noise cancellation will filter out the ambient noise on his end, as well, so the receiver gets the message (literally), loud and clear. 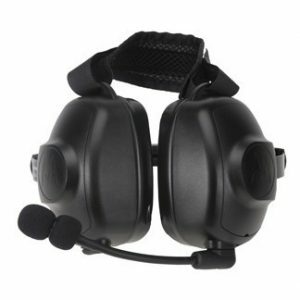 This heavy-duty headset is ideal for industrial users working in high noise environments. Newly designed with soft gel ear seals, this headset offers maximum comfort for extended wear. The behind-the-head style fits under most helmets and connects directly to your radio. With dual-ear speakers and a noise-canceling boom microphone, this headset delivers superior receive and transmit audio. The push-to-talk, located on the ear muff, makes it easily accessible even when wearing gloves. With a Noise Reduction Rating (NRR) of 24 dB, workers’ hearing is protected at all times. 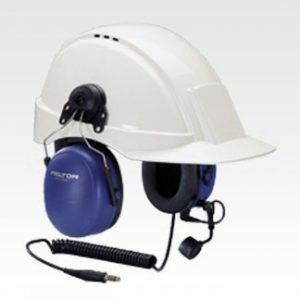 This Peltor® heavy-duty headset, designed to easily attach to your helmet, is CSA-certified for extreme conditions and comfortable for long shifts. With a 24 dB NRR and optimal acoustic design, this headset provides ample space for ears while foam and fluid-filled cushions seal out noise, making it comfortable to wear even on long shifts. 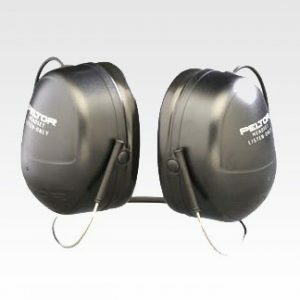 This Peltor headset also features an easily adjustable noise-canceling boom microphone and available external push-to-talk. 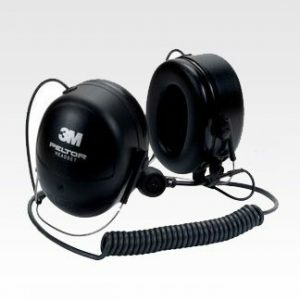 With its carefully designed speaker system and superb attenuation, the 3M™ Peltor™ HT™ Series listen-only communications headset helps provide clear sound reproduction and communication in high-noise environments. This versatile neckband style headset features earcups with liquid and foam-filled comfort cushions for long wear and optimum seal; adjustable, noise-canceling microphone; and flexible, insulated connection cords made from durable polyurethane. 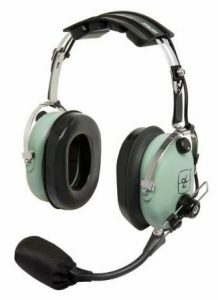 Comfortable and durable, this headset allows for long-term use under tough conditions and has an NRR of 25dB. However, it does require a speaker mic for the user to transmit. Designed for industrial users working in high noise environments, this MT Series neckband headset incorporates 3M Peltor’s technology in both earcup design and electronics to offer hearing protection, durability, and comfort. This versatile headset also features soft foam ear cushions, noise canceling boom microphone and deep earcup design for all day comfort. Push-to-talk adapter is available. 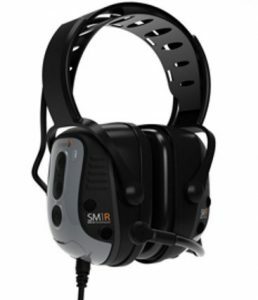 Suitable for heavy equipment operators, airport workers, construction, manufacturing, agriculture or racing, this headset has up to an NRR of 25 db. Similar to the rest of Sensear’s portfolio, it pairs Sensear’s patented SENS® technology and a noise-canceling boom mic to allow users in high-noise environments to communicate either face-to-face or via two-way radios while maintaining 360° audible awareness of their surroundings and protecting their hearing. The Series 9900 Wireless Intercom System is the perfect solution for wireless intercom communications in demanding environments, such as airline/airport de-icing & pushback operations, fire/rescue applications, marine intercom, or any application requiring robust, reliable and secure communications in and around high-noise areas. The H9930 is a wireless, marine-grade version of their legacy mic- shield headsets, providing the same rugged dependability but designed for use with David Clark Wireless Belt Stations. It is a dual-ear, over-the-head style communication headset incorporating a noise-canceling microphone which is optimal for noise environments up to 125 dB (the H9910 headset is appropriate for louder situations). With superlative performance and unsurpassed comfort features allowing for ease of use over long work shifts, the H9930 is an ideal headset choice for use where high noise levels make it difficult to communicate and effective hearing protection is desired. Communications gear with noise canceling capabilities can be a major asset when your team is working in a noisy environment. If you have questions about what equipment would be right for your project, just get in touch and we’ll answer them.